Voltron was one of my favorite cartoons growing up. It just had that right amount of action and adventure (and bright colors) to captivate me and make me want to be part of the Voltron team. So even though I’ve seen some bad adaptations of Voltron since the original (the computer version was atrocious) and read and reviewed the horrible adaption by Dynamite I’m always interested in seeing if someone can recapture the magic of the original. So with trepidation and hoping that it would be better than Dynamite’s version, I gave issue #0 a try. And ya know what? It isn’t that bad. Something needs to be done. A hero is needed. But where to find one? A Colonel and Lieutenant in the Garrison believe they know just where to find one, but first they have to recruit a team of five to go and retrieve it. They recruit from the best in the world, those that are top in their field, and….from the ones that won’t be missed if they don’t come back from this dangerous mission. Their first stop is Lance, one of the top pilots in the world, freeing him from his prison sentence. Next up Sven is recruited for his piloting skills and combat skills. Hunk is recruited next for his engineering skills, Pidge for his programming skills…and finally the leader of the group, Keith is brought on board. Their mission: to retrieve and revive Voltron as a force of good in the universe. Although the story is short, it is issue #0 after all, they’ve done a good job of capturing who the characters are. What makes them, them and what makes them part of Voltron. Now whether they’ll continue this or not remains to be seen, but I enjoy seeing how the five were chosen and a bit about their backgrounds. What really caught my attention though were two things. First that the story is a bit darker, I mean the Colonel comes right out and says that he’s chosen these guys because they are good, but if they fail they won’t be missed. The second is that they’ve Incorporated a bit more of a Japanese influence into the story, even giving three of the characters (Pidge, Hunk, and Keith) Japanese names, which is interesting because in the series they never had full names. And before any fans of the series cry foul, I should point out that Voltron came from Japan, so incorporating more of a Japanese influence helps it get back to its roots a bit and it works well. The one thing that I did like about the Dynamie issue was the artwork, I mean Alex Ross did the cover for it. Sadly though the artwork is a bit…lacking here. The cover in particular doesn’t really do the issue much justice, I was hard pressed to recognize the characters and that’s really my biggest problem with the art. I just don’t like the character design. The depiction of their faces have way too many hard lines and the coloring is bad. I mean bad to the point where they’re attempting to shade the chin/cheeks and it looks like the person is wearing a metal mask over part of their face. There’s just too much separation there. But they do an excellent job of capturing the gleams and glows that I remember being a prat of the cartoon. And they do an excellent job of capturing what the settings should look like in this issue so it feels like we’re with Voltron. They just don’t do well with the design of the characters. Although this beginning of the team is a bit different that the original version, they at least capture the heart of what made Voltron, Voltron. 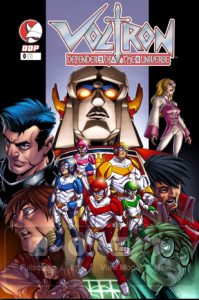 And I really want to see what happens in the second issue, to see if they continue capturing the heart of Voltron. I can also hope that the artwork improves a bit.